S24 IS EASY ACCESS BY PRIMARY CARE TO RESPIRATORY CONSULTANTS HELPFUL? Introduction and Objective: Respiratory problems are a major reason for acute hospital attendance. Several schemes are being explored to reduce admission. Based upon the usefulness of general practitioner (GP) telephone consultations, an open access service was developed, allowing primary healthcare professionals (eg, GP, community matrons, etc) to contact respiratory consultants using a dedicated phone during the working week. They were asked to use this service if the patient was unstable and may need hospital admission. The service provided by the consultant was immediate advice, if necessary clinic review within 48 h or facilitated hospital admission. The safety, feasibility and efficacy of a consultant-led respiratory easy access consultation service were assessed. Methods: The outcomes in patients who were referred by the primary healthcare professionals from 1 November 2007 to 30 June 2008 were evaluated. Patients’ demography, clinical conditions, telephone call response time, waiting time for a rapid clinic appointment, 7 and 28-day outcome (hospital admission, re-consultation and mortality) were analysed. Results: Consultants were contacted about 88 patients (60 female) with an average age of 69 years. Consultants thought all referrals were appropriate and there was no gaming to get earlier clinic appointment. Eight were managed by telephone consultation only, five were given telephone consultation and admitted to the hospital, two were given telephone advice and followed up routine appointment, 73 were assessed at the rapid clinic with three of these patients subsequently admitted to the hospital. In 91% (80/88) of the patients, hospital admission was avoided. Chronic obstructive pulmonary disease (48%) was the commonest respiratory problem. No hospital admission, re-consultation and mortality occurred 7 days after the initial contact. Median (range) waiting time for a rapid clinic appointment was two (0–9) working days. Conclusions: A consultant-led respiratory easy access consultation service is safe, feasible, efficacious and probably prevents hospital admission. S25 WHAT INVESTIGATIONS AND TREATMENTS ARE PERFORMED BY GENERAL PRACTITIONERS BEFORE REFERRAL TO A RESPIRATORY PHYSICIAN? Introduction and Objectives: The BTS recommendations for specialist referral (Thorax 2008;63:S1–16), and ideal referral letter (www.impressresp.com/ManagingDemand) for general practitioners (GP) do not include advice on prereferral management. This survey documented reason for referral and investigation and treatment strategies by GPs before specialist referral. Methods: We recorded the main symptom prompting referral, prereferral investigations and treatments documented in 294 new GP referral letters received by two large respiratory departments in England and Scotland during part of 2008. Any significant regional difference was detected by χ2 analysis. Results: The primary symptom prompting referral was cough in 85 patients (29%), shortness of breath (SOB) in 77 (26%), other in 20 (8%) (seven chest pain, six haemoptysis, seven various), suspected cancer (2-week wait) in 98 patients (33%), and abnormal chest radiograph (CXR) in 13 (4%). No investigations were recorded for 22 (7%) patients. Scottish GPs were more likely to report peak flow (43 (33%) vs 23 (14%); p<0.001), spirometry (31 (24%) vs 24 (14%); p = 0.028) and prescribe antibiotics (43 (33%) vs 20 (12%); p<0.001). The table compares those referred with cough and SOB. 95 (97%) of 98 with suspected cancer had a CXR, 20 (20%) blood tests and 24 (24%) had received antibiotics. Conclusions: The survey found nearly two-thirds of respiratory referrals are for symptom-based diagnostic uncertainty, confirming the importance to patients of availability of a broad trained respiratory specialist. This was in spite of GP-initiated investigations in 93% of patients and trials of antibiotics and/or oral steroids in nearly three-quarters with cough and half with SOB. A quarter of patients with suspected lung cancer had also received antibiotics, an action possibly delaying referral. Blood tests and CXR were commonly used. However, overall less than a third of GPs recorded spirometry and few oximetry, suggesting that the use of more respiratory-specific investigations remains limited. Marked regional differences were found, with Scottish GPs more often using antibiotics and recording lung function, including spirometry. Improving universal access to respiratory investigations in primary care should be helpful, but diagnostic uncertainty will probably remain an important reason for needing specialist referral. Background: Hospital at-home schemes are popular for the management of acute exacerbations of chronic obstructive pulmonary disease (COPD) aimed at reducing demand for hospital inpatient beds and promoting a patient-centred approach through admission avoidance. The British Thoracic Society intermediate care Hospital at Home in COPD 2007 guidelines outline three such models in practice. We studied the efficacy of direct GP referral to the hospital respiratory specialist team in the Hot Clinic in avoiding hospital admissions. The Hot Clinic team is led by the respiratory consultant and assisted by the specialist registrar and respiratory nurse. Methods: GPs and community nurses directly referred patients threatening an acute hospital admission, by fax, for a rapid assessment. The Hot Clinic service operates Monday to Friday, 09:00–16:00 hours. Patients are seen within 24 h of the receipt of the referral letter. The consultation includes clinical assessment, chest radiograph, laboratory data and a decision as to whether to treat the patient in the community or to admit to the hospital. The GP would be informed by a returned typed faxed letter the same day. The efficacy of this service was assessed in terms of admission avoidance and the rate of re-admission within a week and a month of the consultation. Results: Data from 173 patients enrolled between 1 January 2007 and 30 June 2007 were studied. Ninety-seven (57%) were men and 75% either current or ex-smokers. 27 patients (16%) were admitted directly from the Hot Clinic and 146 (84%) were treated in the community. Of those 146 patients, nine (5%) were later admitted within 1 week and 12 (7%) admitted over 1 week to 1 month after the Hot Clinic appointment. Overall, 125 (72%) were thus treated successfully in the community without the need for hospitalisation. Conclusions: This study provides good evidence for the effectiveness of a direct GP referral system to the hospital respiratory team in avoiding hospital admissions. Introduction and Objectives: There is a paucity of national information regarding the service arrangements for chronic obstructive pulmonary disease (COPD) patients to access palliative care services. The data presented here describe some aspects of current service provision and identify examples of good practice in palliative care that may inform future service development. Methods: The 2008 national audit of hospital COPD care included a survey of resources and organisation of care. Within the survey were embedded three specific questions on palliative care services and a free text box to describe examples of good practice already in place. All 184 acute trusts admitting COPD exacerbations from the four countries of the UK were included in the survey during the spring of 2008. Quantitative data were analysed using SPSS version 15 and qualitative data by thematic analysis. Results: 180 NHS acute trusts (98% of those eligible) comprising 239 hospital units completed the survey. 117/239 (49%) of the units surveyed reported formal arrangements for COPD patients to receive palliative care. 31/239 (13%) reported they had a policy for discussing end-of-life decision-making with severe COPD patients when they were clinically stable, and 158/239 (66%) stated they had future plans to develop palliative care services. When asked for examples of good practice five main themes emerged. These included the use of care pathways eg, Liverpool Care Pathway, advanced care planning and utilisation of documents such as the preferred priorities of care, improved linkages through joint MDT, clinics and home visits, improved communication throughout primary and secondary care including the use of the gold standards framework, and the development of formal clinical guidelines specific to palliative COPD patients comprising both symptom management and referral criteria. Conclusions: The majority of units nationwide have no formal arrangements for COPD patients to receive palliative care input. Many, however, have plans to develop palliative care services and the examples of good practice collected within this survey could be formally utilised to provide a framework for national guidance on service provision. Background: To reduce waiting time in the accident and emergency department, a clinical decisions unit (CDU) was established in 2004. Originally used for medical admissions, we have obtained access for inhospital thoracic surgical transfers when previously they would have been added to a waiting list for a surgical bed. We have reviewed the effect of this change in admission policy on the efficiency of treatment for non-elective spontaneous pneumothorax. Patients/Methods: Since the introduction of the CDU admission policy 40 patients (35 men, five women, aged 33 years (16–84)) were referred for further management of spontaneous pneumothorax (group A). This group was compared with the last 40 patients (29 men, 11 women, aged 28 years (16–75)) who were admitted directly to the surgical wards before CDU (group B). An intergroup comparison was made of the following parameters: referral to transfer time, transfer to surgery time and the length of inpatient stay in referring and tertiary hospital. Results: Data are expressed as median (range), see table. There were no significant differences in the indications for or type of surgery performed between the two groups. The total length of inpatient stay in the referring and the tertiary hospital was significantly reduced for group A (12 vs 15 days, p<0.001, Wilcoxon), which was attributed to the earlier transfer of patients 18 h (1.5–120) versus 78 h (3–148; p<0.001, Wilcoxon). There was no difference in the length of inpatient stay after surgery. Conclusion: Allowing surgical access to a traditional medical admission unit significantly improves the efficiency of non-elective pneumothorax surgery. Introduction: Thoracic ultrasound is increasingly performed by respiratory physicians to aid diagnosis and intervention. The Royal College of Radiology (RCR) has recently published recommendations for training non-radiologists, and a physician-delivered service based on these recommendations is established in Oxford. The aims of this study were to assess the: diagnostic and interventional ultrasound activity of this service; complication rates in comparison to published standards; referral rates to radiology. Methods: Since 2006 a dedicated thoracic ultrasound service has been provided by two staff (NMR, HED) after a 3-month training period according to RCR guidelines by consultant radiologists (RB, FVG). Details of indication, operator, findings, interventions and the need for radiological referral and complications were prospectively recorded and are here analysed between January 2006 and December 2007. Results: 468 ultrasound scans were undertaken in 385 patients. Indications for ultrasound were: diagnostic 97/468 (21%); prethoracoscopy 108/468 (23%); aspiration 84/468 (18%); intercostal drain insertion 179/468 (38%) (59 indwelling catheters, 120 intercostal drains). The number of ultrasounds conducted increased over time (fig). Referrals to radiology for ultrasound procedural assistance were measured as a proportion of all ultrasounds, excluding prethoracoscopy and indwelling catheter insertions, n = 301. Radiology referral occurred in 17/301 (5.6%, 95% CI 3.3 to 8.9) cases, including 8/204 (3.9%, 95% CI 1.7 to 7.6) for intervention and 9/97 (9.3%, 95% CI 4.3 to 16.9) for diagnostic interpretation. The proportion of referrals increased over time (c2trend 1 df 4.0, p = 0.045; fig). A single complication (intrapleural bleed) occurred in the ultrasound intervention group (excluding thoracoscopies, n = 263), giving a complication rate of 1/263 (0.4%, 95% CI 0.0 to 2.1). This rate is comparable to the rate reported in published series of ultrasound-guided pleural procedures, whether conducted by physicians or radiologists (24 studies combined, 97 complications in 3920 interventions, rate 2.5%, 95% CI 2.0 to 3.0). Conclusions: Respiratory physician-based thoracic ultrasound is safe after level I RCR training. It is associated with a complication rate comparable to that seen in the published literature. Continuing close liaison with radiologists is required for a physician-based service. 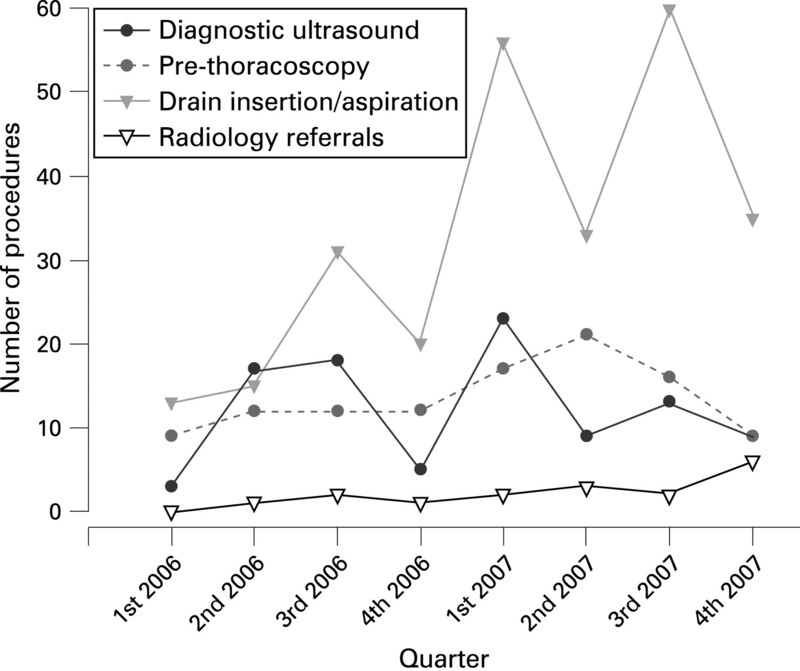 Abstract S29 Figure Thoracic ultrasound activity over time by procedure type.